Rent Collection for Landlords. Payment for Renters. Paying rent online anytime, anywhere on any device could not be easier. Electronic rent payments by credit card and e-check. Online Rent collection made simple. Get started today and start collecting rent online tomorrow. Property and apartment online payments. We offer a secure payment method using WEPAY. Credit card data is saved in a safe environment. We do not have setup costs. We believe that you should only pay for the renters that use the platform. The Rental Pay, Inc. works with property management companies to stay updated with the platform and we are the developers of the platform. We will integrate into any platform to make your life easier. Developer support is always available. 24 hour email support; call toll free: 855.502.RENT. Free up your life with The Rental Pay, Inc.
Pay Rent online for rentals and mortgage anytime, anywhere. Pay rent with credit card and echeck. Recurring billing option. 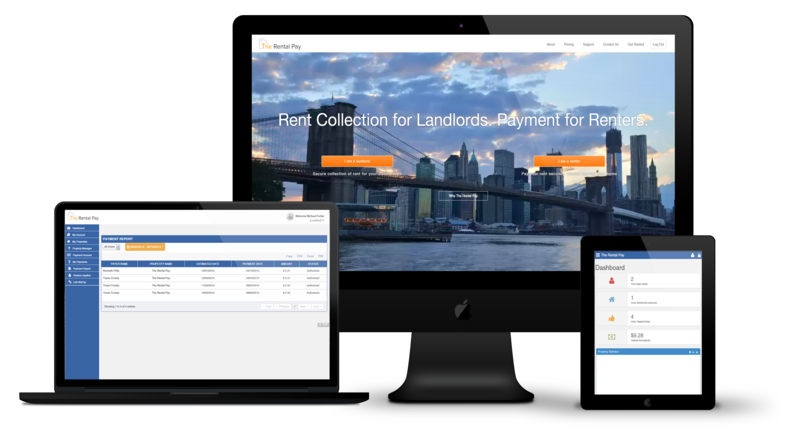 The Rental pay has an easy to use backend system to pay rent online on PC, tablets, and phones. Our easy to use system will helps to create a hassle free rent and mortgage collection. No more late fees, no more monthly fees. Complimentary website and marketing package: learn more. If you would like information about how to collect rent online contact The Rental Pay, Inc.